Choose Undercover hotels at 11 UK airports. 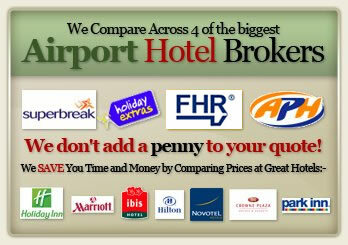 Book Airport Hotels or Airport Hotels with Parking. We compare Mystery hotel prices from not just one but Four of the UK's leading providers including Holiday Extras, Superbreak, APH and FHR. Stay in an airport hotel at Heathrow room only for as little as £43. Why Book a Secret Hotel? Undercover hotels offer the best value when booking an airport hotel. The hotel will be situated at or close to the airport and may also offer a car parking package. We are able to offer our undercover hotels at the lowest posible price because the identity of the hotel remains a mystery until confirmation of your booking is complete. Choose from a selection of of 3 and 4 star hotels at 11 UK airports. All Undercover hotels that can be booked through us are already featured on our website. Plus all details of the hotel and directions will be provided once you have booked. Staying at an airport hotel is a great way to start your holiday. Spend the night before your flight feeling relaxed without any worries about being caught in any moring rush hour jams, feeling totally refreshed for your travel in the morning. Plus by staying close to the airport will mean short transfer times to the terminal. If you are in fact looking for a Hotel Mystery Guest Company then try Convivas. They have 16 years experience is auditing hotels to avoid those negative reviews.